This is the Divisional Round of Pete Rozelle’s dreams. Of the final eight teams, seven look equally good. The eighth is from New York. It’s a tournament bursting with storylines and marketable stars, but lacking a clear favorite. Things looked much different five weeks ago. The talk then was about a lack of parity, of undefeated seasons, of three juggernauts that looked destined to cruise to conference championship weekend. Before the Minnesota Vikings faced Arizona on Dec. 6, the Colts, Saints and Vikings combined to have a 34-1 record. They are 5-8 since. Once unstoppable, the trio looks wounded. Did the late-season malaise matter or was it just a detour on the path to a title? Were the teams ever that good to begin with? The rise: This was supposed to be a down year for Indianapolis. Tony Dungy left, Marvin Harrison retired and there was offseason unrest about Peyton Manning’s favorite coaches. New coach Jim Caldwell drastically changed Dungy’s defensive system by hiring Ron Meeks as coordinator, sparking a lot of criticism. It didn’t take the Colts long to show they were different than during the Dungy era; they were better. They were tougher. A 14-12 win over the Jaguars in Week 1 was typical of the season to follow. The defense, not Peyton Manning, won the game at the end with its pass rush. When Anthony Gonzalez — Harrison’s replacement — was injured, young unknown receivers Pierre Garcon and Austin Collie stepped in. The only surprise is that Manning wasn’t required to lead a fourth-quarter comeback. His first comeback came the following week at Miami, and then he did it six more times. In half the games Manning finished, he led the team from behind for a late victory. Manning has enjoyed better statistical seasons. So has the offense as a whole, and the defense. But there has never been a better regular-season Colts team than the 2009 squad. They were tougher in short-yardage situations, stuffing the Ravens repeatedly in a Week 11 win. They didn’t blink when safety Bob Sanders was lost for the year. The Colts' defense blitzed in key moments instead of always sitting back in Dungy’s Cover Two scheme. It all worked. Manning had plenty of magical moments, but he also had help. Robert Mathis, Gary Brackett, Dwight Freeney, and Antoine Bethea took turns making huge plays at critical moments. The Colts used to blow teams out; now they leave each opponent thinking they should have won. But none of them did, at least for the first 14 games. On the doorstep of history, the Colts turned around. By now, you know the details. 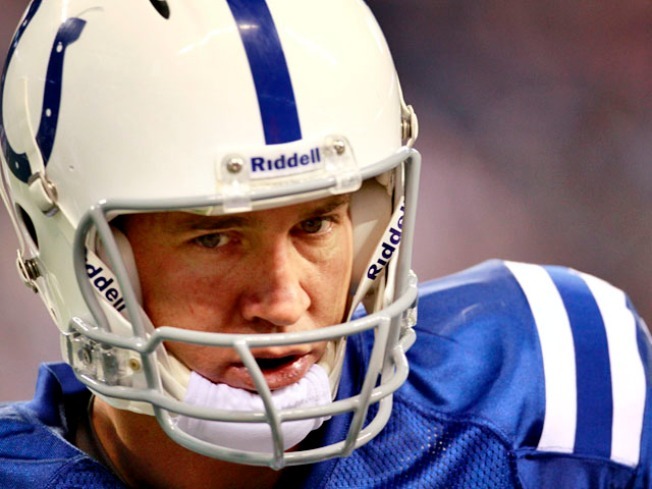 Caldwell and General Manager Bill Polian waited too long to sit Manning — until the third quarter of a close game in Week 16. Long-time Colts fans, among the most pleasant in the league, felt betrayed. They said they would give up their season tickets and that a Super Bowl trophy wouldn’t make up for the decision to lose. Reason left the building. Taking Manning out showed how fragile the Colts are. The backups on both sides of the ball were second rate. In five and a half quarters with Curtis Painter at quarterback, the Colts were outscored 48-7 by the Jets and Bills. This was never a dominant Colts team. In many ways, they were like the ’72 Dolphins that scraped by week after week, barely beating opponents. Call it chemistry, call it toughness, call it clutch or call it luck. The ‘09 Colts are notorious for laying down the last two weeks, but they were more like a misunderstood band of overachievers, led by some big-name stars. The mental toughness and situational football that got the Colts to 14-0 is why they are well positioned to survive two more close games and make it to Miami. Nothing has fazed them. This Colts team is different. Brett Favre was supposed to be a caretaker. He was to hand the ball off to Adrian Peterson and keep the Vikings offense on schedule. In the first two weeks, that’s exactly what happened. Favre threw for only 265 yards combined in Minnesota’s first two wins, while Peterson ran wild. Everything changed in Week 3. In his first home game, Favre completed the play of the year. Twelve seconds remained on the clock. Favre went back to pass, bought time in the pocket, slid to his right and completed a 32-yard rocket to Greg Lewis with two seconds left to stun the 49ers 27-24. He took a huge hit just after he released the ball. It’s laughable in retrospect that anyone said Favre’s arm strength was no longer first rate. The following week, Favre was flawless in a win over the Packers. The roll was officially on. Peterson was suddenly putting up pedestrian numbers. Minnesota’s secondary gave up its share of big plays. Yet none of it mattered: This was Favre’s team. With an unheralded receiver (Sidney Rice) and a rookie (Percy Harvin) as his top targets, Favre played like he was 10 years younger. The interceptions went down and the MVP talk picked up. After a win at Lambeau Field and a Week 9 bye, the Vikings won their next three games by a combined score of 88-29. The only question was whether the 10-1 Vikings could catch the undefeated Saints for the NFC’s top seed. The season turned in the Arizona desert. The Cardinals confused Favre and repeatedly knocked him to the ground. The mental mistakes piled up in a 30-17 loss that wasn’t nearly that close. Minnesota righted the ship the following week against Cincinnati, then lost two straight games, including a 26-7 embarrassment in Carolina. Perhaps the 10-1 record wasn’t as good as it looked. Six wins came against Cleveland, Detroit, St. Louis, Seattle and Chicago. The San Francisco win was thrilling, but the winning play was a miracle. A win over Baltimore hinged on a miss kick by the Ravens. Favre and his teammates were at their best against the Packers. Other than the win in Green Bay, the Vikings lost three of their last four games outdoors. The good news for Minnesota: they won’t have to play in cold weather again. The bad news: no one is sure exactly how good this team is. Favre’s slump ended at halftime of Week 16, when he nearly led an epic comeback against the Bears. But his six-quarter rebound came against two broken defenses: Chicago and New York. Dallas presents a much sterner test. The Vikings need Favre to be great because there are holes elsewhere on the team. Cornerback Antoine Winfield isn’t 100 percent, and the secondary is thin. The linebacker group hasn’t been the same since losing E.J. Henderson in Arizona. The once-vaunted offensive line has been mediocre at best. If Peterson isn’t gaining yards, that’s on them. Signing Favre was clearly the right move. But his age and history adds a mountain of pressure to Sunday’s game against Dallas. This is Minnesota’s window, but they look the shakiest of the three teams that were on top of the league just a few weeks ago. A franchise without a Super Bowl win is only three away from nirvana. But they are only a loss away from Armageddon and the worst part of the Brett Favre Experience: the offseason. If Favre wins the same amount of postseason games as Tarvaris Jackson did last year (zero), what will the team really have been gained from the year with Favre? Except for a long-term extension for coach Brad Childress, that is. The Saints were very good, very fast, yet no one saw it coming. The team was ranked below average in all of the preseason power rankings. The key was continuity on offense, and one major change on defense. No other group in football is deeper or has played together longer than Sean Payton’s crew. That opens up the playbook for Payton, perhaps the best play-caller in football. Reggie Bush is the third most important running back on the team. Last year’s leading receiver (Lance Moore) missed almost the whole season and it didn’t matter. The team has the patience to wait for players like Devery Henderson and Robert Meachem to develop because they trust the system. They plug in guys no one wanted (Mike Bell, Pierre Thomas, Dave Thomas) and get production. All because of Payton and Drew Brees. We started looking differently at the Saints after they put up 48 points in Philadelphia in Week 2. After putting up 48 against the undefeated Giants in Week 6, the Saints were suddenly Super Bowl favorites. There were two Saints teams this year. There was the juggernaut that squashed Philadelphia, New York and New England. More often, though, there was loss-defying squad that would spot inferior teams big leads, and then narrowly escape. New Orleans had close wins over teams like St. Louis and Washington. They trailed in the fourth quarter in games against Miami, Atlanta, and Carolina. Rarely was a Saints game decided early. By the time Dallas won in New Orleans in Week 15, you could almost feel the pressure being relieved. Even Drew Brees said he started to believe some “voodoo” was helping the Saints. The loss reminded the Saints they were just a football team, not an Anne Rice story. The Week 16 loss at home to the Bucs suggested the Saints had lost their edge. They didn’t even bother trying the following week at Carolina. 13-0 became 13-3. Pass protection was starting to fail, and injuries took a toll at every level of the defense. Williams’ pass rush was no longer getting home. There is still reason to believe this Saints team is special. It has won in a variety of ways. You are never sure what group will show up, but the team has played its best with the spotlight the brightest. More importantly, the team is healthy again. The starting cornerbacks, a huge key to their success, will play together for the first time since midseason. The team’s best run-stopper, Sedrick Ellis, is back to plug holes in the middle. The linebackers are over some nagging injuries. The three-headed running back of Pierre Thomas, Mike Bell and Bush are finally healthy at the same time. The NFC has four quality teams left capable of making it to Miami. But New Orleans has the trump card, a Superdome crowd ready to go crazy for the best team in franchise history. Like the Colts and Vikings, the Saints have been knocked down after epic starts. All three teams prove a Bill Parcells maxim: You are never as good as they say after a win or as bad as they say after a loss. Make no mistake; the Saints are pretty good. The team is almost as desperate to taste victory again as the town they play in. Perhaps a month without a win isn’t such a bad thing. Together since 2006, the Saints know that the journey they want to take doesn’t truly start until Saturday.